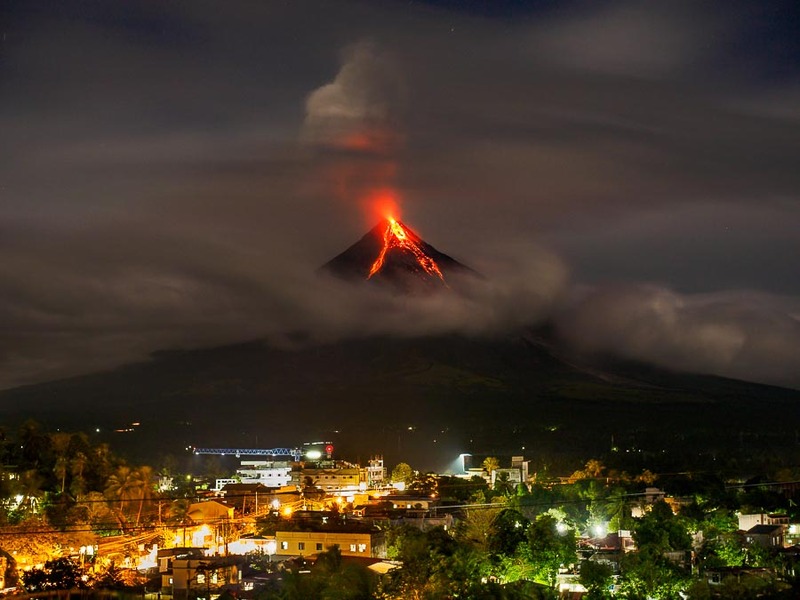 Mayon volcano, one of the most active in the Philippines, erupts on Tuesday, 23 January 2018. This picture was made from a viewpoint in Legazpi, about 13 kilometers from the volcano. E-M1 Mark II, 45mm f1.8 lens, ISO200, f2.8, 111 seconds. 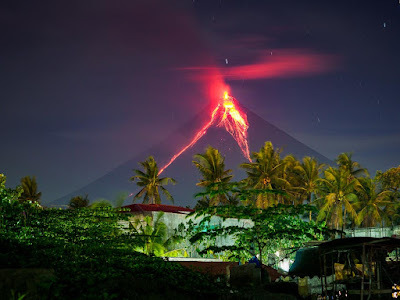 I'm in Legazpi photographing the eruption of the Mayon volcano. I've learned a lot about volcanoes on this trip. 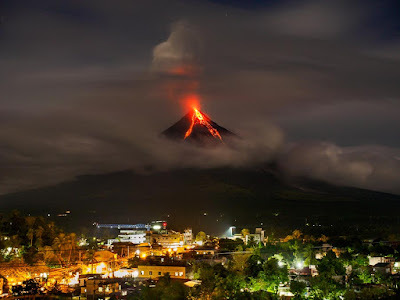 Volcanic eruptions are a process - it doesn't erupt and then go back to sleep, especially Mayon, which has been continuously active for centuries. An eruption Monday afternoon, 22 January. E-M1 Mark II, 12mm f2, ISO200, f4.5, 1/3200. Photographed in Camalig, about 8 kilometers from the volcano and just outside the danger zone. Instead it's a process. Pressure builds up in the volcano and it starts a series of eruptions. Those eruptions may, or may not, culminate in a massive destructive eruption that destroys huge swaths of land and causes thousands of deaths. Mayon rumbled back life in the middle of January. I waited a week, to make sure it wasn't a false alarm, and then flew to Legazpi. 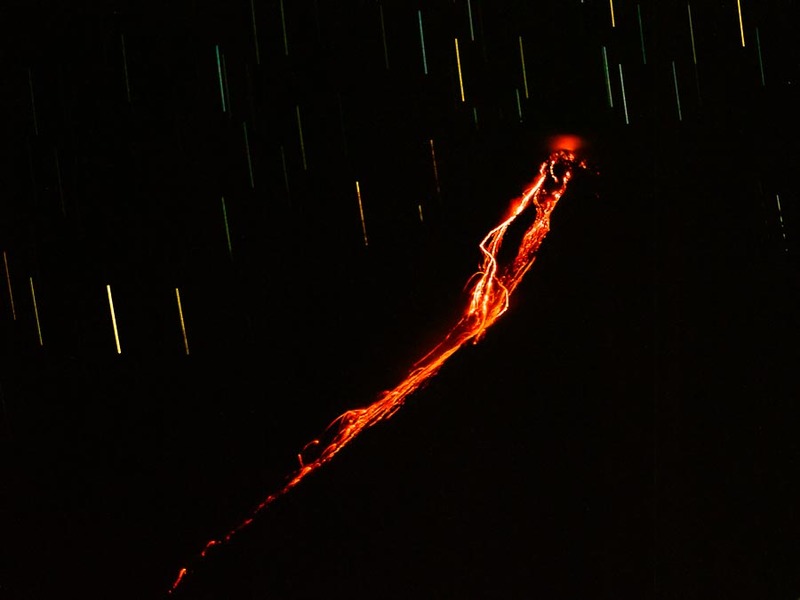 The timing on volcanos is tricky. Too soon and you end up waiting for "the" eruption. Too late and you miss it. In this case, I feel like the timing worked out pretty well. 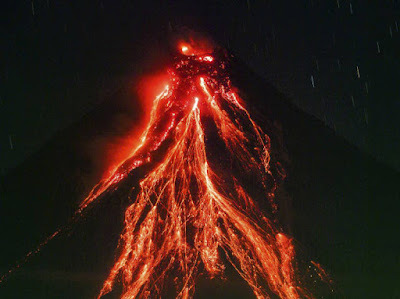 What I now think of as a medium sized eruption on Saturday, 20 January, my first night in Legazpi. E-M1 Mark II, 40-150mm f2.8 Pro Zoom, ISO800, f4.0, 0.5 seconds. Tripod. Made from the fire exit of my hotel. This was made late at night with no ambient light left in the sky. I got into Legazpi on 20 January, on the first flight of the day. The volcano was quiet, and it was cloudy and rainy - we couldn't have seen the volcano even if it had been active. We went out to the evacuation centers and photographed people in the centers. After several hours in the centers, I checked into my hotel and started editing the pictures I made during the day. I made the photo of the small lava flow just before I went to bed. I went out to check on the volcano and lava was flowing down one side. A better lava flow but still no ambient light, made on 22 January. E-M1 Mark II, 40-150mm f2.8 Pro Zoom, ISO200, f4, 75 seconds. This was the same day as the dramatic eruption I saw in Camalig. Tripod. The volcano really roared to life on Monday afternoon. 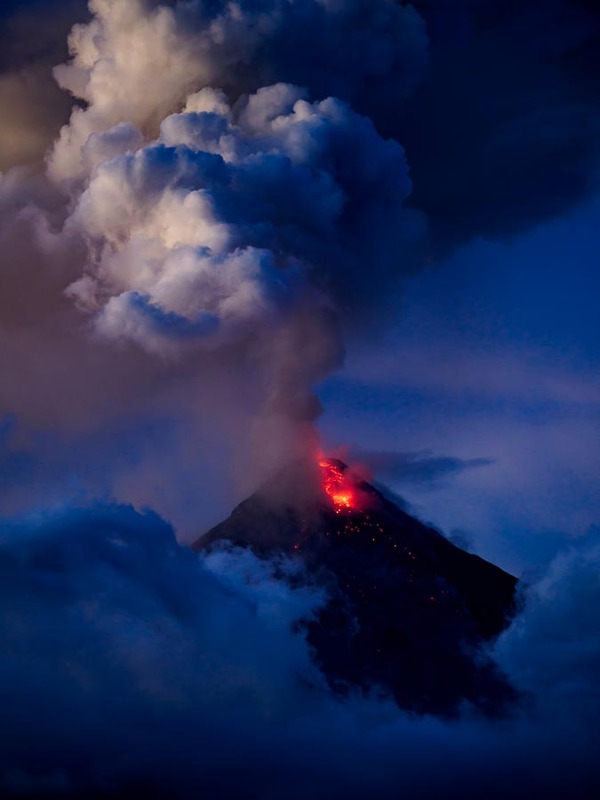 There was the dramatic eruption in the middle of the day and another dramatic eruption that started about 8:30 in the evening. 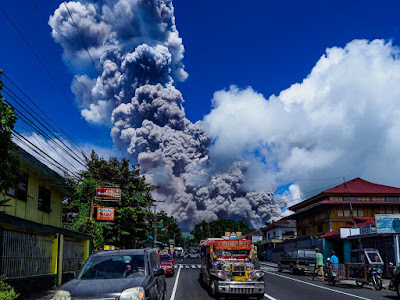 The afternoon eruption triggered more evacuations and pushed out the danger zone. Authorities also raised the threat level from 3 to 4 (on a scale of 0 - 5). Zero is the lowest threat level and Mayon is seldom at zero. When I asked what "normal" was, a volcanologist told me level 1 was normal for Mayon. I asked about zero and he said it was at zero for a "few months" in the early 2000s. If it goes to level 5 it means a cataclysmic eruption is underway. Covering a volcano that is erupting intermittently is kind of a matter of luck. We spend the days driving around the countryside at the base of the volcano (usually outside the evacuation zones) looking for photos of evacuees or people coping with the volcano's disruption. Then when the volcano erupts we photograph the eruption. Sometimes it's both at the same time. 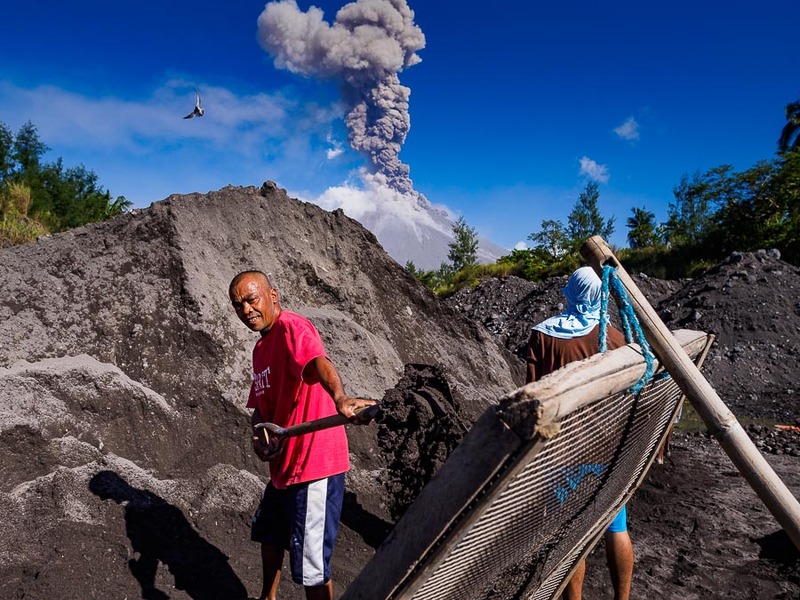 A worker mines volcanic rock and sand in ancient lava flow of Mayon just as another eruption starts, 23 January. Pen F, 12mm f2, ISO200, f4, 1/2000. This was made just inside the danger zone. When an eruption took place during the day, we would drive to communities on the west side of the volcano to photograph the ash fall. We were always too late to make a good ash fall photo. We worked the west side of the volcano one day to be prepositioned for the ash fall, but it was cloudy (we couldn't see the cone) and the volcano was relatively inactive. That's where the luck thing comes into play. On Thursday, 25 January, I took the day off to deal with some airline issues (the airport was closed and I needed to rebook my return to Bangkok) and to rest a little after five days of very intense photography. The volcano was pretty quiet through the day, but I decided to take a chance that we'd have an eruption, and I went to a church that has a great overview of the mountain. And luck came back into play. Luck. I was set up and waiting for an eruption so I could make a time exposure. A couple who had just gotten married in the church walked out on the overlook and the volcano erupted. Pen F, 17mm f1.8 lens, ISO400 f4 1/30. I could have gone to any of a handful of overviews. 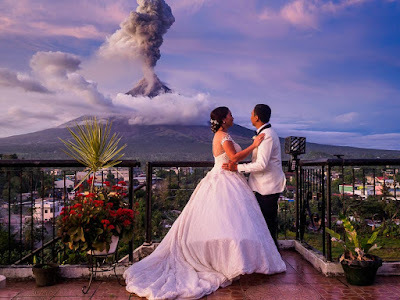 The volcano could have decided not to erupt. The clouds, which socked in the cone when I got to the church, could have stayed and obstructed the view. But everything worked out. Same place, 10 minutes later. E-M1 Mark II, 75mm f1.8 lens, ISO400, f2, 1/13th. Handheld. This is a picture I went to the church to make. I was hoping for a sunset eruption because I wanted to hold some detail in the sky and get a foreground that represented a human presence. The lava flow wasn't huge, but I was satisfied with the way the photo came out. Pen F, 25mm f1.8 lens, ISO200, f4.5, 148 seconds. Tripod. I'm going to be in Legazpi until 01 February. Between now and then, I hope to photograph some more eruptions and I will photograph more of people coping with the volcano. That is turning into a huge challenge for the local governments. PhilVOLCS, the government agency that monitors volcanic activity, is predicting Mayon could be like this for weeks or months. Disaster preparation planners are expecting people will have to live in the shelters for three months. That means the government needs to find a way to care for and feed the people for three months. Schools are used as shelters here, so it also means the schools have to juggle the students' needs against their community responsibility as a shelter. More than 80,000 people have been forced out of their homes. So far the government has been able to meet their needs, but even if the volcano doesn't have a cataclysmic eruption, the situation could still spin into a humanitarian crisis. I plan to write another blog entry about the shelters when I get a chance to. There are many more photos of life under the volcano in my archive or available from ZUMA Press.